Another month has flown by and November is here. Hard to believe! – BB, CC, DD creams etc. I have tried a few BB creams, but had yet to try a CC cream. It is supposed to treat, correct and protect your skin with buildable coverage. Upon trying this, it has a thick consistency and feels kind of sticky. You need to work quickly when blending it out, but it seems like a decent product. Will have to use it religiously before seeing any results that it claims! – I’m quite excited to try this! I’m always looking for good makeup cleanser/removers. I am currently using micellar solution to remove my makeup and I feel that this beauty oil will provide a similar experience. – Not too pleased with receiving a perfume sample as I do not usually wear perfume and still have tons of other scents I am trying to get through. This smells nice, but it’s not something that I will be using. – The scent of this soap is very overpowering! Upon opening the lid, I could definitely smell it. It is true to its name and smells quite like lemongrass. Just my thoughts on this, but I feel that this is not a “deluxe” sample product. Sure, I’m all for supporting handcrafted soaps, but I do not feel that it justifies being included in a beauty box where makeup and skincare products are more of the expectation. – I had emailed Topbox after receiving my October Topbox because I received a repeat product (this has happened a couple of times already) and they responded back saying that they would include an extra product for this month. I was pretty pleased to see this! I have heard so much about this lipstick that I actually purchased it a couple of weeks ago as it is a universally flattering colour. The deep colour looks intense, but it goes on more sheer and you can build it up by adding more applications. 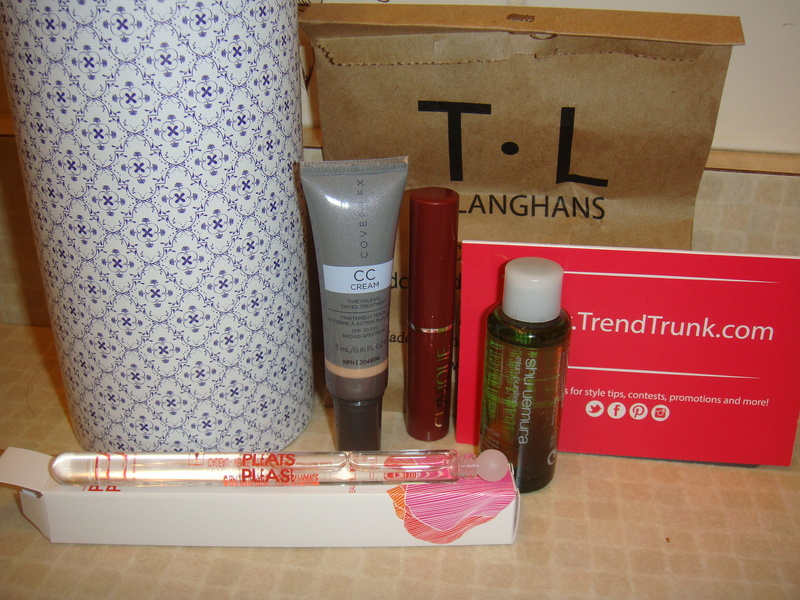 Also included was a surprise valued gift card for Trend Trunk. Overall, I will be trying/using 3 of the 4 products (with the exception of my added extra product). I am kicking myself for not participating in the $10 add on that Topbox offered to receive a surprise full size product. I have seen some who have received a flat iron and Benefit palettes! Luck of the draw. What did you receive in your November Topbox?